I have paint bottles spread all over my room ..
Might as well work on these as well. Both sets were picked up at different Yard Sales somewhere in the past (not worth researching), and were tucked away in a cabinet. I'd forgotten about them, but went looking for a couple tamborines that I know are around here somewhere, and found these instead. The small set are mini's; about 6" long. They were obviously used by a small child as a teether; the teeth marks are apparent. The larger set is 13". Both are nice, sturdy wood. I fetched a piece of sandpaper out of the shed and sanded them down. I'll work on these with the other items and report back !!! Amazingly enough, I really wasn't in the mood this morning. I'm getting to the stage where I have so much 'stuff' that I can't imagine ever getting it all used. But, I needed to take Beau to the trailhead (so he could do a long run home) and I needed to go to the Gym, so I did, of course, follow the three garage sell signs between the two, as well as two more between the gym and home. And 1 barret, which is new on the card and I'll probably wear. I've been having little talks with myself on how I'd like to move away from the jewelry findings. 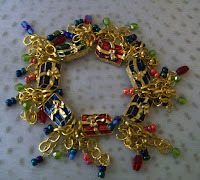 I consider the beaded items I create more accessories than jewelry, but I'd really like to move back towards the art. But, I just keep seeing things that would work so well and for a quarter ... well heck. So, I assume this become something I'm going to have to reconcile. At least, they don't take up much room from the storage standpoint ! At it's inception two months ago, I volunteered to be part of management team of The Trading Post Guild over at Artfire. The concept of the guild is simple and sounded such fun. 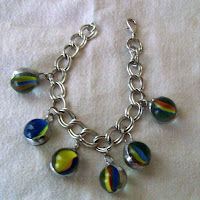 It's a group of Artfire artists and crafters who all join together and make trades. If I see something in another members shop I'd like to have, I send them a message to see if they would like to negoatiate a trade. The ground rule is the value + shipping is close to equal, or if not, dollars can change hands. Sometimes the answer may be no (for a whole lot of reasons), but, when the answer is yes, I can be GREAT FUN. 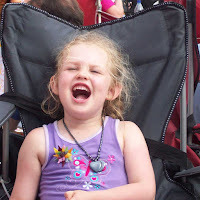 For my part in the management of the guild, I seem to be the primary writer of the Blog. 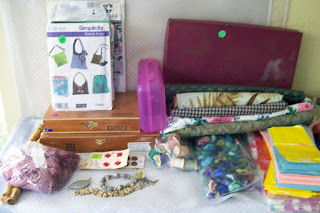 In the blog, I profile a different shop every couple days and here and there, might right up something else as well. I've met a couple quite interesting people and find the effort well worth the time it takes. So far, I've made two trades. First, this great bear that I'm going to give to Lilly for Christmas from Patchtique. And, second, this sweet beaded necklace from Hummingbirdtak that will go to my sister-in-law for Christmas. Starting in November the guild is having what is called a Trade & Stay event where for one week everyone trades with everyone. Kind of like a contest, but not a contest; Just alot of Fun. I'm looking forward to it. I've been dabbling with these abit here and there over the last two days. It's dappling, because, since I have the paints out, I'm also working on more painted pages and 6 sets of placemats. Needless to say, the studio is back to disaster zone .... work on this, set aside to dry and work on the next thing; set aside to dry ... over and over again times about 12. It's alot of fun. 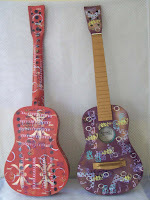 So, added some poetry / writings to each of the guitar using a black permenant marker. 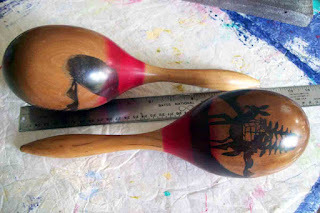 Then, brought out the stamps and a variety of paint colors and stamped them up. At this stage, I'll seperate them and work them seperately as each may take a different design angle. So, they'll be set up on the workbench, perhaps a couple; maybe more while I decide on the rest of the individual design features that will give them unique personality. I'm guessing there's somewhere around 400 patterns here. They date between 1999 and 2004 and, interestingly enough, they are all in 'new' condition. Not a single pattern is cut. I've now been through them all, and yep, there were about 30 patterns that were either for purses, or contained purses, so I'm happy about that. There are also dozens and dozens of really cute things that I'd love to make ... if only I were a seamstress, or interested enough to become one. List them (one by one) in my Artfire Supply Shop. Although I charge $5.00 per pattern, I'm sure the processing time would work out to be less than minimum wage .... Oh well ... I did get those 30 purse patterns ! So, if you are a Seamstress, come on over and check out my patterns ! A cold front came in yesterday and it was wonderfully cool outside; 58 deg.f and to make things even better, it's not raining. I had three yardsales marked from the paper and found several more. 2 Cigar Boxes .. I'm thinking I'll turn these into Treasure Boxes for Lilly (store junk jewelry for when she's abit older. A package of glass globs ... great colors for solder experiments. A whole stack of bags (which I'll put in the art/craft show supply box). 1 Scrabble Game. I'll pull out letters 'A I M E E' for the bracelet I'm making for our neice for Christmas. The rest of the letters go to inventory, the letter holders to 'blocks inventory' and the game will either go to the wall or I'll recreate as a piece of wall art for Lilly's room. 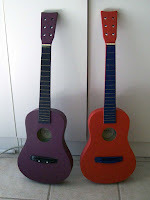 I picked my colors; a shade of purple for one guitar and shed red for the second. 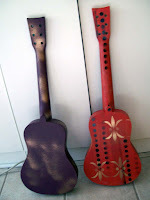 Painted two coats on each guitar, front, back & sides. Painted the neck and string bracket a deep blue on the red Guitar. This takes a good bit of time as I like to let the paint dry a couple hours between coats. 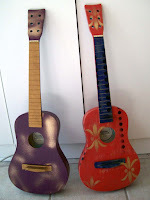 Today I added Gold Oil Paint to the Neck of the Purple guitar, a little acrylic highlights to both and took outside to spray paint some stencils on both. Stamps are next, but will have to wait; heading to an OctoberFest event. I don't know how you feel about your computer, but I have a sweet laptop that I call Leroy. Leroy and I have an intimate relationship; I frequently spend several hours a day fondling his keys, and in exchange, he charms me by getting my work done, showing me glorious pictures and endearing me with knowledge from the World Wide Web. Well, sadly enough, Leroy's been on the rocks. I took him to the PC doctor last week and learned I've been a bit hard on him and wore out the mouse and click assembly, of which was entirely repairable (Hear the angels sing). And, after bearing an appropriate credit card, replacement parts were ordered. After much anticipation, the part finally arrived and, Leroy was returned to the PC doctor this morning for emergency repair (he became officially clicked out last night). BUT, alas ... the surgeon, after several hours, advised the manufacturer sent a faulty part! (Big Alligator tears dripping down my face). It has to be reordered and for efficiency sake, Leroy stays at the PC hospital, comatose and in intensive care .... probably an entire week. I'm devasted. Now, I have to communicate on this big ole monster of a desktop computer in a chair that allows no slouching. Woe is Me; Poor Leroy. For the last couple days I've been thinking of painting, been finishing off a few things laying around, cleaning off the table tops and such. When I finished the Crown this morning ... todays' the day. Current thinking is I'll paint for the next week or so. 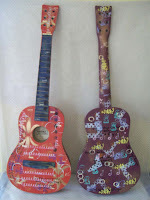 Starting point is these two child size guitars. Both are yard sale finds; one from 5 months or so ago and one from last weekend. Removed the strings, hardware, and decals. Took outside and sanded. It not necessary to strip them, but the current paint needs roughed up to hold the new layers of paint. I'll start working them tomorrow. 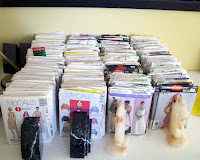 As I mentioned, I picked up 6 boxes of patterns at a yard sale two weeks ago. 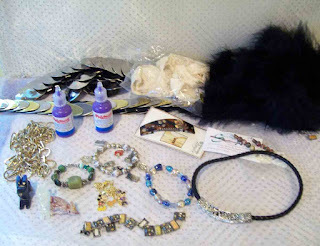 I've been going through them; keeping about 10% and listing the rest in my Artfire supplies shop. I came across a costume pattern yesterday that had a crown (Simplicity 9454, copyright 2004). I found myself thinking about putting it together, with some of those gawdy plastic gems (that came from the same yard sale) to create a wonderful little girl Crown for Stella's Christmas present. The gems on the fabric was way to stark, so pulled out the container of laces. Selected a wide lace and 2 different ribbons, decided on the place and stitched into place. Played around and decided on the placement for the gems. Using my handy dandy Dremel (one of my favorite tools), drilled little holes into the plastic gems. Sewed each of them into place. The directions on the pattern called for gluing on the ornaments, but that didn't sound quite sturdy enough for a 6 year olds' play. Sewed the front and back pieces together, turned right side out and did some decorative top stitches. The pattern called for sewing the ends together, but decided on attaching with Velcro instead .. easier to ship flat as well as to put away (ya right) when she's not playing with it. 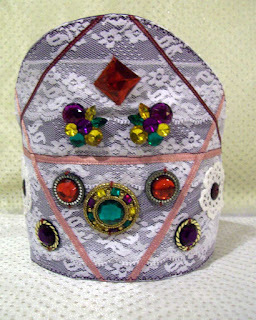 And ... drumroll please ... Crown Jewels for Stella ! 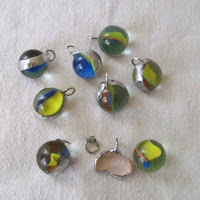 I picked 8 generic marbles (I must have literally thousands in inventory). As it's an experiment; it doesn't really matter what they look like. Cut and attached a thin piece of foiling tape around each marble, overlapping about 1/2". Soldered a jump ring. The jump ring sits at the top of the overlap. Soldered the rest of the way around each marble. Sanded out rough or unattractive points with the Dremel. Two pieces fell apart almost immediately. One the tape just came off, intact and the other the tape appears to have failed at the seam. I'm guessing, on these two, that I didn't get the tape attached well enough. Attached the remaining 6 to a marble to a silver chain bracelet, which I've put on and am going to wear for the next few days; kind of like a stress test. About two weeks ago I picked up 7 boxes of 'stuff' at a yard sale for $40. 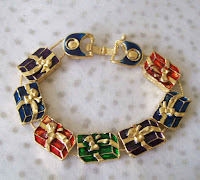 Size of the boxes were patterns and the final boxes was odds and ends of, what looked like, junk jewelry. I started routing through the box to see what was in there when it was offered for $10.00. Well ... okay ... a $10.00 grabbag. There were a good number of button covers; 1/2 of which I put in my supplies shop and the other half went to Grans Thrift Shop, along with bunches of really gaudy looking earrings, which I've taken apart for the plastic gems. At the bottom of the box I found about 15 little metal bracelets. Some were pretty little metal Packages and the rest were hearts and diamonds; gambling motif. These sweet little packages caught my attention (the rest I took apart and put the metal charms into inventory). I decided to dress it up into a more chunky charm type. Cut 8 small sections of chain. Attached 3 of the beadsets to each link of chain. Strung them all together on stretch string. It's a fun little piece. Spacious = occupying much space; vast. I heard this line, entirely spacious, this morning on The Today Show. I was passing through the living room when some realtor was discussing a bedroom size. It struck me ... entirely spacious ... does those two really go together. And now, I've been stuck on it all day. Entirely Spacious. Like this house before I put all the clutter in it ? I'm sure there will be alot more to follow. And, now I'm wondering what it will be. Usually when I get hung up on some phrase, it usually results in some odd art project. It's play week here. A whole lot of fun and mess making going on here; but very little in the world of arts & crafts. 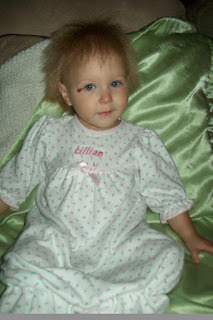 Lilly's momma, Nikki, is having a baby this week (with her new husband), and Lilly is staying with us. She came last Wednesday, Momma is having the baby today and she'll probably stay a couple more days, at least until Momma gets home. So, we've been swimming in the hot tub every day, playing lots of ball, and petting the cat (who's an incredible sport). Daddy & Mary have come to play a couple times and we took her to Destrahan for the LSU football game on TV; family party. It's been great, but grammie (me) is learning a whole new interpretation of exhausted. Keeping up with a 14 month baby takes quite abit of energy (patience, fortunately, isn't one of my problems).